Two Door Storage Cabinet. 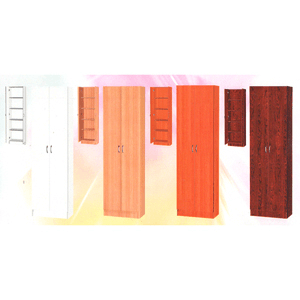 2 Doors, 4 Shelves Storage Cabinet For Kitchen, Bathroom, Bedroom And Laundry Supplies. Rack Constructed Of Chip Board. Easy To Assemble. Holds approximately 32 pairs of shoes. Comes with 4 shelf and a hanging rod. Dimensions: 31 In.(W). X 72 In.(H). X 16 In. Also Available in 23.5 In. (W) x 16.5 In. (D) x 63 In. (H) in White, Beach, Cherry, Black, Light Cherry and Mahogany Finish. (D).